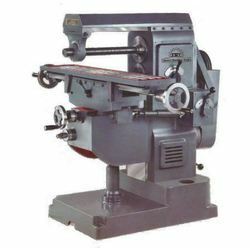 Prominent & Leading Manufacturer from Rajkot, we offer universal milling machine. We are offering Universal Milling Machine to our clients. We provide high-quality products to our clients. Drive V-Bett drive by 1 HP. 3 Ph 1440 R.P.M. Flange Mounted adjustable motor, creates low noise. Quill 100 mm Dai with 100 mm Travel Quill. Vertical Travel Fine feed by Star Wheel with indexing dial Fast feed by Drill type Handle. Spindle nose ISO 40 with Draw bolt System. Model HVA-1: Direct V-Belt drive four step Pully 820-1200 -1730-2520 R.P.M. Model HVA-2: Direct V-Belt drive by four step pulley with double Gear System 73/515-103/720 -164/1150-250/1800 R.P.M. Looking for Universal Milling Machine ?